If you've got a question about Birmingham airport parking, you may find the answer here on our Birmingham airport parking FAQs page. What does gate rate mean? The gate rate is the daily price charged at a car park if you were to turn up and pay without pre-booking. The gate rate at some car parks can be very expensive, so it's always best to pre-book to get a good deal. How can I amend my car details on my Birmingham airport parking booking? You can change your car details at any time, free of charge. If you have access to the internet, you can alter your car details through our website on the manage my booking page. Just fill in your booking reference and email address, then go ahead and change your details. Alternatively, contact us and we'll be able to do this for you. 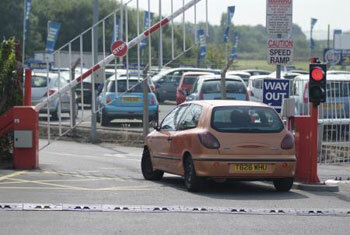 You are required to hand your car keys over at Airparks Birmingham and Stress-free Meet and Greet parking. You can keep you car keys if you park in the Birmingham Short and Medium Stay car park 1, Birmingham Short and Medium Stay car parks 2 and 3 and the Birmingham Long Stay car park 1. What is Meet and Greet parking at Birmingham airport? Meet and Greet parking is where your car is collected from you outside the terminal, parked in a secured car park by a chauffeur, and brought back to the terminal when you return from your holiday. Meet and Greet parking is great if you're travelling with children, have lots of luggage or are disabled. Stress-free Meet and Greet parking is the only Meet and Greet service available at Birmingham airport. What happens if I go over my pre-paid parking period at Birmingham airport? When you return to your car and leave the car park, you will normally be charged for the extra hours or days you've overrun. The extra payment will be charged at the car park's normal rate. Your booking confirmation acts as your receipt, with the credit/debit card number and price both displayed.